The diversity and versatility of display devices today imposes new demands on digital media. Designers must create different alternatives for webcontent and design different layouts for different devices. Traditional image resizing techniques are oblivious to the content of the image when changing its height or width. In contrast, media (i.e, image and video) retargeting takes content into account. For example, one would like to change the aspect ratio of a video without making human figures look too fat or too skinny, or change the size of an image by automatically removing “unnecessary” portions while keeping the “important” features intact. Here is a simple operator; seam carving to support image and video retargeting. A seam is an optimal 1D path of pixels in an image or a 2D manifold in a video cube going from top to bottom or left to right. 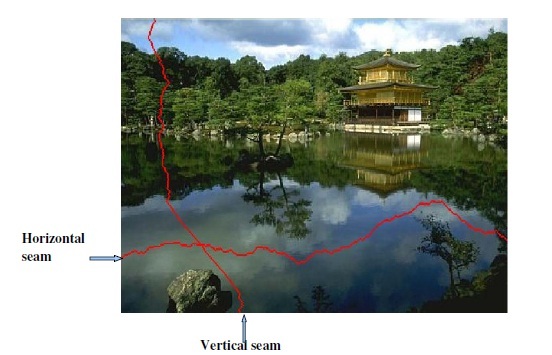 Computing a seam reduces to a dynamic programming problem for images and graph mincut search for video. A seam is a path of pixels that travel horizontally or vertically with low energy. Horizontal seam: A connected line from left to right that can move at most 1pixel 1 pixel per row. Vertical seam: connected line from top to bottom, that can move at most 1pixel per column. Connectivity : the pixels of the seams must be connected. For ease of exposition, we will focus on images first, then we will show how to extend the seam carving operator to handle video. Our approach to contentaware resizing is to remove pixels in a judicious manner. Therefore, the question is how to choose the pixels to be removed? Intuitively, our goal is to remove unnoticeable pixels that blend with their surroundings. Since human vision is more sensitive to edges, we give high value to edges using the following simple energy function. Given this, or similar, energy function, assume we need to reduce the width of an image. One can think of several strategies to achieve this. For instance, an optimal strategy to preserve energy (i.e., keep pixels with high energy value) would be to remove the pixels with lowest energy in ascending order. This destroys the rectangular shape of the image, because we may remove a different number of pixels from each row. If we want to prevent the image from breaking we can remove an equal of number low energy pixels from every row.